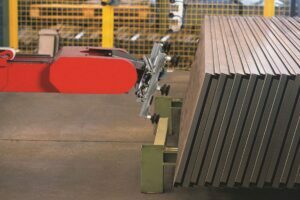 Home > News > Machinery > Sheet and Plate > The Antil APR Robotic Arm – Has the future of machining arrived? 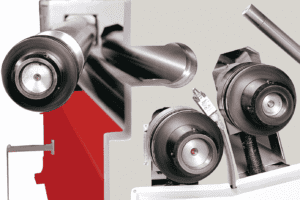 The floor mounted Antil Robotic APR Robot Arm is a machine of the future. A robotic appendage that does the job as effectively as a human, but without the need for a lunch break or toilet interruptions. The APR makes automatic bending operations a breeze. 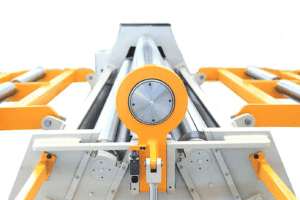 The smooth operation of the arm together with its 5 axes – three linear and two polar – gives it maximised maneuverability to perform any bending, tilting or rotating operation effortlessly. The automatic switch-off system means that the APR can run into the night when all your staff have gone home, and that equals higher productivity for your business. The beauty of the APR is that it is very easy to use. It carries out automatic bending operations alongside the traditional Hydraulic Press brake, but if you want to switch to using manual mode, then a simple and quick transition means that the APR can be parked out of the way for manual batch work. The positioning of the APR is crucial if it is not going to hinder the production, which is why the arm will always remain in the horizontal position, holding the piece above and below. And its linear axes mean that the arm will always be in front of all the bending stations. The hollow shaft of the robotic wrist holds the air, vacuum and electrical feeds, meaning no risk of cutting the delivery lines. The plate gripping tool with suckers means no sliding work pieces, and more precision. Although the APR arm has the technological sophistication to impress, unfortunately, it cannot do everything (yet). You will still need a worker to programme the arm initially. But the simple software means that very little training is needed. 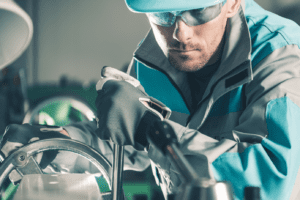 It is a simple and fast programming procedure, which can be carried out from a PC by anyone who is familiar with the bending process – the machine can be up and running its predesigned programme in no time. This innovative hardware can handle up to several hundred kg loads, and the overhead gantry design allows forklifts to continue freely feeding and removing material. This means less staff are needed to move heavy loads or large sheets into position for bending. Fewer workers mean reduced human error, risk and maximum productivity for your business. Of course, safety is always a top consideration, which is why the APR is fitted with a lateral safety grid and frontal safety light barrier. All these features give the Antil Robotic APR Robot Arm the level of technological sophistication yet unsurpassed in machining evolution, and it is already proving to be a huge success in the sheet and plate fabrication industry. Add the APR to your work team for a higher level of productivity and increased output. It will never ask for a holiday, and there’s no better return on your investment.